What is it? – Shopping City is an enhanced sequel to Shopping Street, in which you must build and upgrade a series of increasingly large open-air shopping malls in order to obtain a certain amount of profit within an allotted number of days. Who made it? – The game was developed by flonga.com. How does it play? 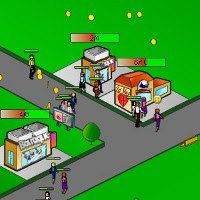 – Each of the game’s 9 different stages presents you with street full of empty lots, and gives you some cash to begin building your sales empire. You'll need to accrue a certain amount of cash within a certain number of days. If you haven’t already, I’d recommend checking out the original game (Shopping Street) and our review. Shopping City takes the core gameplay of its predecessor and improves it in a number of ways. Stores are still built and upgraded in the same way, but there are more stores this time around. This time around, you can also build police and fire stations. These won’t help your minute-to-minute profit, but they will stave off unfortunate incidents of thievery and fire that may save you money in the long run. Presentation – The cartoony storescapes are vibrant and colorful, and it’s amusing to watch the pedestrians go about the business of making you rich. An isometric gameplay perspective is also used, in lieu of the straight 2D visuals of the previous game. This has a tangible impact on gameplay, because certain levels now have multiple streets and intersections. Pedestrians will still move towards the right side of the screen, but sometimes you’ll have to make a decision about which street is the best on which to build a new establishment. Positives – Probably the most welcome and notable difference is the increase in difficulty. While it was relatively easy to blast through the first iteration without failing, you’ll need to put a lot more thought into all aspects of your store-building schemes if you want to win this time. Negatives – Casual players may not be as welcoming of the increase in difficulty. I suppose it’s worth noting that before actually completing them, I managed to come up less than 1% short of my required cash flow for the first two levels. While I did welcome the spike in challenge, losing by such a minor fraction of required income was kind of a head scratcher, especially when considering how to adjust my tactics towards success. Why you should play it – Shopping City is a very solid strategy game that does a great job of upping the ante over the original in both presentation and gameplay. Fans of the first game should definitely check it out, as should anyone who fancies themselves a sim-strategist.